By earning the OPSWAT Certification, Roboscan Inc. has shown their worth by proving their software is compatible with a long list of leading technological solutions that are used by virtually all SMB and Fortune 500 businesses. San Francisco, CA based Roboscan Inc., the creators of powerful personal and enterprise internet security software have continued their award winning streak by winning this years OPSWAT Certification. The OPSWAT Certification Program is the industry standard for interoperability certification of endpoint security software applications. The program is designed to enable independent software vendors to ensure the compatibility of their applications with leading technology solutions. OPSWAT Certified products are verified interoperable with solutions from vendors like Juniper, Cisco, Citrix and many others, allowing your applications to be easily integrated on millions of endpoints. Leonard Lee, Vice President of Roboscan, commented by saying, “We are very proud of the accomplishments we have had in the early stages of bringing the products from a very successful Asian market and into a very competitive U.S. landscape. If you start with a solid product and take the right steps to integrate it into a new market, the product should speak for itself. So far, this is exactly what we have seen. As time goes on, we expect nothing but good things to happen with Roboscan and those who decide to use it as their core internet security software”. 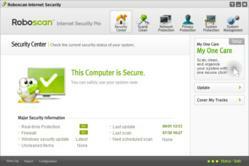 Roboscan Internet Security is an integrated antivirus program that is designed to protect your computers from the multitude of online threats. One of the key features that makes Roboscan Internet Security unique to the other antivirus software on the market is the minimal PC resources that it utilizes. Along with it’s "Smart Scan" technology, this allows the PC user to enjoy a computing experience that ensures minimal boot time and low memory/CPU usage. Those who use heavy graphics, memory and CPU usage will see a vast increase in the performance of their machine. One group that comes to mind is the gaming community. Since the product was build around their needs, it’s only natural that this would be the ideal product for that niche. A free version of Roboscan is available for download on their website and more information on Roboscan Inc. can also be found if you visit their website at http://www.roboscan.com or email them at support(at)roboscan(dot)com.